This vibrant village is the shared space between talented people of Cape Town. 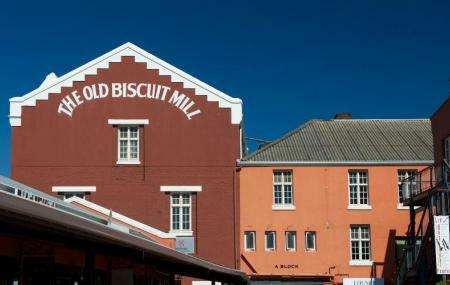 Initially a biscuit mill, the place flaunts a set of entertaining activities like day and night markets, workshops, designer stores, farm stalls and restaurants. A great entertaining place in Woodstock neighbourhood of Cape Town! Also, visit the popular attractions in the city by following Cape Town itinerary 2 days. How popular is Old Biscuit Mill? People normally club together Rhodes Memorial and Jewish Museum while planning their visit to Old Biscuit Mill. Really great spot for a bite to eat on a Saturday morning with plenty of great choices and options. Most people would give this a five star but because it's so busy and there are many tourists it can get a bit too busy and crowded. Suggest going early for brunch and beer. Pot Luck Club do a great little breakfast here. Top tip! Greatest variety and cultures coming together in one place. From drinking coconut milk to eating empanadas. Most of the food are made while you wait. Even better is seeing how it has been made. Great tourist attraction. Even eating ice cream made with real fruit that you can see clearly. Also, the art. The proudly South African products. Definitely worth a stop when in Woodstock. Love visiting on Sat early morning. Great fun and something for everyone. Don't park in suburban side roads though. The people want to charge R30 for parking in the road and if you don't comply they puncture your tires. This is the perfect spot for souvenir shopping and gifts. This place is bursting with fun. I would recommend to there before the holidays begin as most shops are closed in December during the festive season.